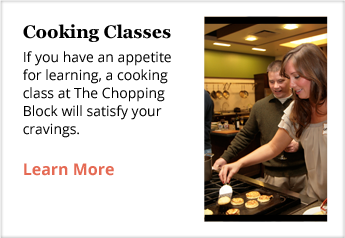 Our Culinary Boot Camp 2 allows you to continue your culinary education with even more advanced cooking techniques and recipes. New subjects, including baking, shellfish and handmade pasta, will be covered in this next step of your journey, plus you will delve even deeper into topics and ingredients introduced in Culinary Boot Camp 1. Sweet and Savory Doughs: Learn the differences in flours, how to prepare yeast risen doughs, quick breads, pie dough, pasta and gnocchi doughs. Sauces, including timeless sauces such as Bordelaise, Fruit Chutney, Mole and Pan Sauces. How to select the right cut of meat for the desired cooking technique. You will also explore several ways to cook beef, pork and lamb. Vegetable cookery, including properly preparing Swiss chard, kale, squash and beets. Grains including lentils, farro, millet and masa. Fish and shellfish techniques such as searing, steaming, brining, smoking, roasting, sauteing and grilling. You will learn to make accompanying sauces such as Sauce Vert, Remoulade, Bearnaise, Coconut Curry Sauce and more. Desserts: You will receive an education in a broad base of pastry techniques, including cakes, caramel, mousse, meringue, ganache, custards, rolling and piping. Students are strongly encouraged to enroll in Culinary Boot Camp 1 prior to Culinary Boot Camp 2. However, completion of this course is not a prereequisite, and we are happy to discuss which program is the best fit for you. 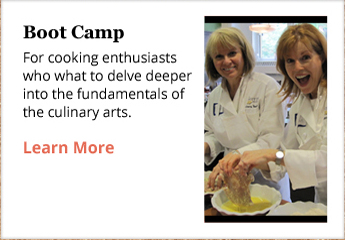 Culinary Boot Camp 2 is five consecutive days, Monday through Friday, 8:30am-4:30pm each day. Upon completing Culinary Boot Camp 2, each student will receive a Certificate of Completion from The Chopping Block. 2-week cancellation policy.